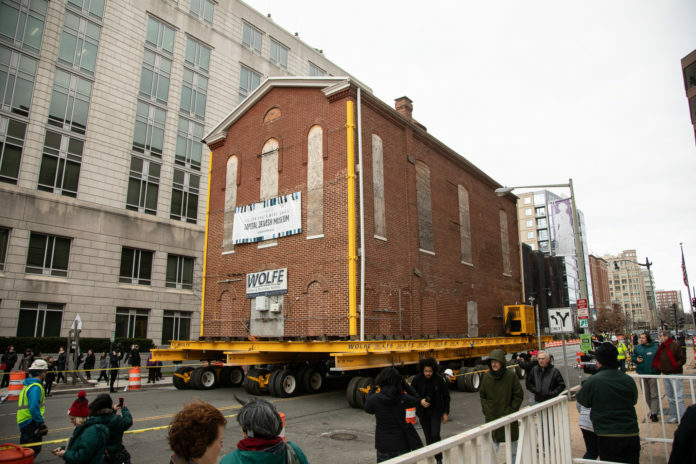 The oldest synagogue in Washington, D.C. has been transported on wheels to its permanent location of 3rd Street NW on January 9. The new Capital Jewish Museum is likely to open in 2021. Originally established in 1876 on the corner of 6th and G Streets NW to host the Adas Israel congregation, the synagogue cost $4,000 and took three months be built. President Ulysses S. Grant, the first U.S. president to attend a Jewish service, took part in its dedication at that time. “The new museum will have an unconventional, experimental spirit – engaging visitors through immersive storytelling, compelling artifacts and hands-on interactive experiences that explore the city’s story through a Jewish lens,” said the organizers about the latest shift to the new address. On the day of the moving, Kara Blond, executive director of the Capital Jewish Museum; Del. Eleanor Holmes Norton; Ward 2 Council member Jack Evans; At-Large Council member Elissa Silverman; Jon Parrish Peede, the chairman of the National Endowment for the Humanities; and Adam Rubinson, a board member of the Jewish Historical Society of Greater Washington, were present and spoke about the move in front of spectators who have gathered on the occasion. Located in Cleveland Park neighborhood, Adas Israel is the largest Conservative synagogue in Washington, D.C.